The Whole Megillah (TWM): When did you first realize you were a writer? Linda Elovitz Marshall (LEM): When I was in fifth grade, my teacher gushed over a story I’d written and said I’d be a writer someday. That sounded nice, but I thought it would be more fun to be a farmer or a jungle-explorer, maybe a hermit. I didn’t realize that, as a writer, I could do all those things. As time went on, I realized I could write well, but I thought writing was a skill that anyone could learn. I also didn’t think I had much to say. It wasn’t until my late 30s that I realized I had a strong writerly voice…and a lot to say. I also realized I could get paid for writing. What a shock! It was like someone paying me to breathe. Since that realization, I’ve written for magazines and newspapers, as well as children’s books. I do a lot of my writing curled up in bed. Now, how good is that? TWM: How did your first book contract come about? LEM: I was new to writing for children when I saw a notice about the Jewish Children’s Book Writers Conference. I figured…I’m Jewish, the conference fee’s relatively low, and the timing’s convenient. I’ll go! I sent in my application. Then I realized the conference might be for people writing for Jewish children. Hmmm, I wondered, Which of my stories might be suitable for Jewish children? As I considered this, I realized most of my stories are inspired by my heritage, so I played with a couple of stories, spicing them with a bissel garlic and chicken soup. 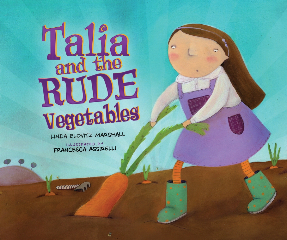 One story, Talia and the Rude Vegetables, I wrote specifically for the conference. At the conference, I had a critique session with Judye Groner, an editor at Kar-Ben. I showed her two of my stories. She didn’t like either and told me why. I listened intently so I could understand what she was seeking and why she was not interested in my stories. I went home, thought a lot, discussed my ideas with my critique group, thought a lot more, and re-worked the stories. Then I re-submitted them both. That’s how I sold my first two manuscripts. TWM: Where do you find your ideas and inspiration? LEM: I find ideas and inspiration everywhere, especially in words. For example, I got the idea for Talia and the Rude Vegetables while I was simultaneously peeling carrots for a root vegetables stew and planning a lesson for one of my adult ESOL (English for Speakers of Other Languages) students. While peeling, I thought about the differences between the words “root” (pronounced with the long “u” sound and “t” at the end) and “rude” (also with a long “u” sound, but with “d” at the end). I realized that, for a non-native English speaker, the “t” and “d” sounds can easily be mixed up…So, I wondered what would happen if someone – perhaps a child – did mix up those words? I thought about the folk story of the “Old Man and the Turnip,” borrowed a bit from it, and created “rude” vegetable stew. The inspiration for Grandma Rose’s Magic (KarBen, 2012) came from my grandmother, who was a fabulous seamstress and saved the money she made from sewing to buy beautiful dishes. 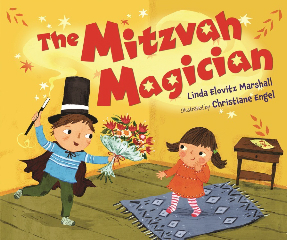 The inspiration for The Mitzvah Magician came while I was at a conference listening to Judye Groner talk about books for Jewish children. I put together the words “mitzvah” and “magician” and made up the word “mitz-gician.” Then I created a story to go with my made-up word. The magic words that The Mitzvah Magician used came to me by…magic. TWM: Do you share your work with a critique group? If so, please describe. LEM: I have a critique group with three other writers. I write mainly picture books, but my critique partners write MG and YA. We do a lot of brainstorming together and are very supportive of each other. For example, Talia and the Rude Vegetables was originally a story about a grandmother and a grandfather. One of my critique group buddies suggested I make it about a grandmother and a granddaughter. That made the story much better; it was a great suggestion. TWM: How important is it to you to write on Jewish themes? LEM: I write about a lot of different things – frogs, tadpoles, “rude vegetables,” gardening, misunderstandings, pirates. I care about making the world a better place, about fairness and equality, nourishing the spirit, helping other people. Is that Jewish? Maybe. I prefer to believe those are universal values. TWM: What have been your greatest challenges? LEM: There’s a story I’ve been writing for years…and years. 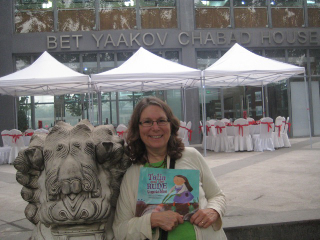 Many years ago, I showed a scene I was writing to a wonderful editor, the late Deborah Brodie, whom I’d met through the Jewish Children’s Book Writers Conference. Deborah encouraged me to write more scenes and to weave those scenes into a longer story; actually, Deborah did more than encourage me…she said that I must write it. It took a long time, but last summer, I told her it was almost ready for her. She advised me to continue doing as much as I could and then to get back to her. I re-worked a lot of the story. When I finally got back to her, she was ill. Now she’s no longer with us. I hope to finish it some day…and to dedicate it to her. TWM: What have been your greatest satisfactions? Seeing the story of our little Passover lamb bring joy to many children. Speaking to audiences about the writing process, reading and, of course, my books. TWM: Once you had a contract, please describe the process in working with your editor(s) and illustrator(s). LEM: I’ve had two publishers – a small publishing house, KarBen (Talia and the Rude Vegetables, Grandma Rose’s Magic, The Mitzvah Magician), and a large house, Random House (The Passover Lamb is forthcoming Spring, 2013). Both experiences have been great. And the illustrations have been amazing! I’m so happy! TWM: What advice do you have for aspiring writers? LEM: Read, go to conferences, think a lot. 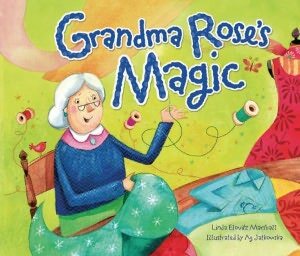 This entry was posted in Authors and tagged Grandmother Rose's Magic, Jewish children's picture books, Kar-Ben, Linda Elovitz Marshall, Talia and the Rude Vegetables, The Mitzvah Magician, The Passover Lamb. Bookmark the permalink. Great interview, as usual, Barbara. Very inspiring. The books look like a lot of fun. I will have to check them out. This was a wonderful interview. It is fun to learn about authors and how their experiences influence their books’ content. I’m especially interested in seeing how Jewish content is threaded through a story. Hopefully, I will be able to locate these picture books in my local public library. Thanks for the information. Thanks, everyone, for the kudos. And special thanks to Linda Elovitz Marshall for a great interview! Thanks, Barbara, for a really interesting interview. I am always impressed by how successful authors are willing to accept critique and by doing so, they make a better book or story.